Undated — (AP) - The most expensive presidential advertising campaign in history closes Tuesday after eight months with President Bush, Sen. John Kerry, their political parties and allied groups having spent more than $600 million. That's triple the amount spent on TV and radio commercials in 2000. Still, for all the money, the race remains a statistical tie, even though Democrats have a spending advantage. Since March, Kerry and the Democratic Party have poured about $250 million into TV and radio ads compared with about $240 million for Bush and the Republican National Committee. Democrats have even more of an edge when spending by outside groups is included. Liberal organizations bought about $70 million worth of airtime, outpacing the $40 million or so spent by conservative organizations. "The story this whole year has been the sheer volume of ads," said Evan Tracey, president of TNS Media Intelligence/Campaign Media Analysis Group. "This is an election that I think changes politics." Despite the unprecedented spending, only about one-third of the country was inundated with commercials. Ads ran on national cable networks, but most aired on local TV and radio stations in the 17 most competitive states. In the final two days of the campaign, commercials are focused on nine states where polls show the race extraordinarily tight - Florida, Ohio, Iowa, Pennsylvania, Wisconsin, New Hampshire, New Mexico, Nevada and Minnesota. Republican and Democratic strategists alike say the biggest reason for the record spending was the 2002 campaign finance reform law, which barred political parties from collecting corporate and union money. So, the parties hustled to raise hordes of money from individuals, but those donors were beholden to contribution limits. Enter a once-obscure type of interest group. Dubbed "527s" for the section of the federal tax code they fall under, the groups proliferated to collect multimillion-dollar donations from such figures as billionaire philanthropist George Soros on the left and San Diego Chargers owner Alex Spanos on the right. The story this whole year has been the sheer volume of ads. This is an election that I think changes politics. Democratic insiders formed such groups early on to ensure the party's nominee was competitive on the air. The Media Fund, created by former Clinton administration official Harold Ickes, has aired about $55 million worth of TV and radio ads, the most of any Democratic-leaning group. After a legal challenge by Republicans failed, GOP-aligned groups formed to supplement Bush's efforts. Progress for America Voter Fund, an arm of a group headed by former Bush aide Tony Feather, has spent the most - at least $20 million. There were other reasons for the record spending. The constant stream of general election ads began months earlier than in previous elections. Bush's campaign launched a spring offensive to define Kerry negatively in voters' minds, forcing Democrats to counter. Bush and Kerry also rejected public financing for the primaries, freeing them from fund raising and spending limits before their nominating conventions. And both had plenty of money to spend after raising record amounts. The nominees each accepted $75 million in taxpayer money for the general campaign. The campaign finance law also said their campaigns also could control only $16 million of the money collected by their national party committees. But Bush's campaign figured out how to spend more than the $16 million without violating the law by making the ads about GOP House and Senate candidates and the president. Kerry and the Democratic National Committee soon followed suit. Independent of Kerry's campaign, the DNC spent about $100 million on ads, an effort that helped keep him competitive on the air, especially in August when he suspended most advertising to save money. By comparison, the Republican Party has spent about $15 million, independent of the president's campaign, on ads in the last two weeks. Kerry's campaign also stretched its advertising dollars by reserving airtime in August for the final two months and locking in lower rates. It also bought ads at the lowest prices even though it meant they weren't guaranteed to run when the campaign wanted. The campaign paid a higher rate when told a certain spot might be pre-empted. 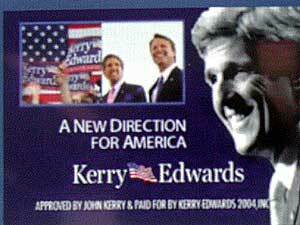 The result was that Kerry's campaign paid a lower price for some of its ads in some media markets than Bush's. Public records from a TV station in Cleveland, for example, show that Kerry's campaign spent $250 to run an ad once between 9 a.m. and 10 a.m. on Oct. 5, compared with the $375 Bush's campaign paid to air a commercial once in the same period. Democrats all but wasted about $40 million by advertising in GOP-leaning states they had hoped to put in play before giving up - Arkansas, Arizona, Colorado, Louisiana, Missouri, North Carolina and Virginia. Still, buying airtime there forced Bush's campaign to spend at least $25 million defending those states.